today we went bowling. soccer pre-season is three weeks this year, so we decided to give the girls a bit of a break today. here is owen with kate, they are a year apart and she wanted to do everything he did. 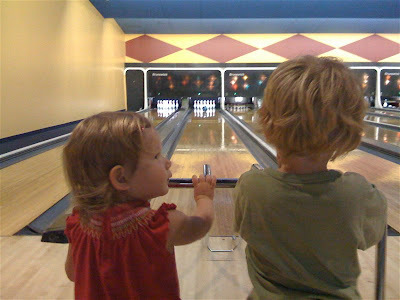 it was really cute seeing them bowl. we lasted about an hour before owen wanted to hit up the video games, unfortunately i forgot quarters.